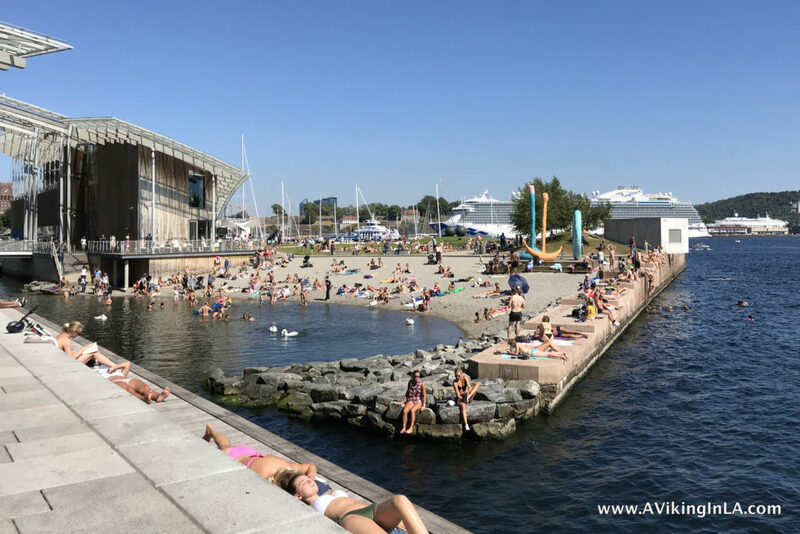 Oslo Harbor Promenade: Venice Beach the Oslo Way! 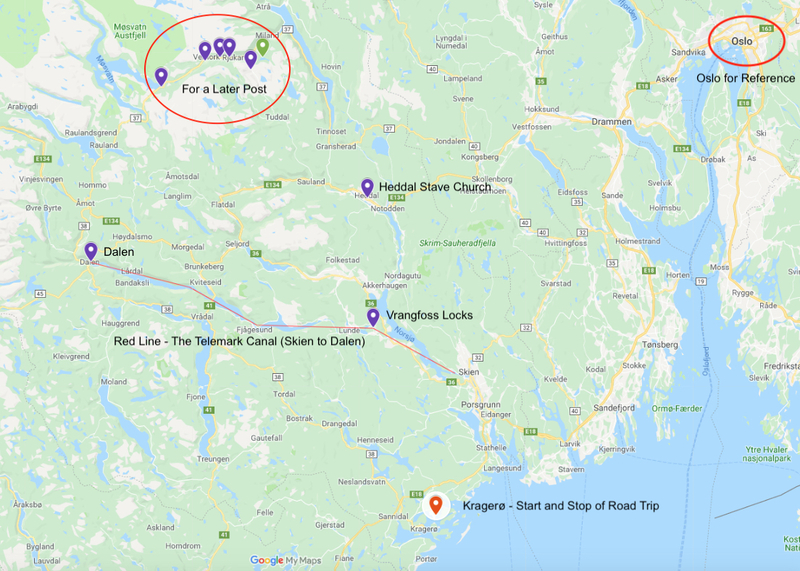 Our adventure began at Frognerkilen (Point #1 on the map). We were greeted by the peaceful sight of docked boats and wandering ducks and geese. The first stretch of the promenade was a pleasant and leisurely walk right along the shoreline. We enjoyed watching boats coming and going and swans searching for food. In the distance, we saw the ferry bound for Denmark leave port. 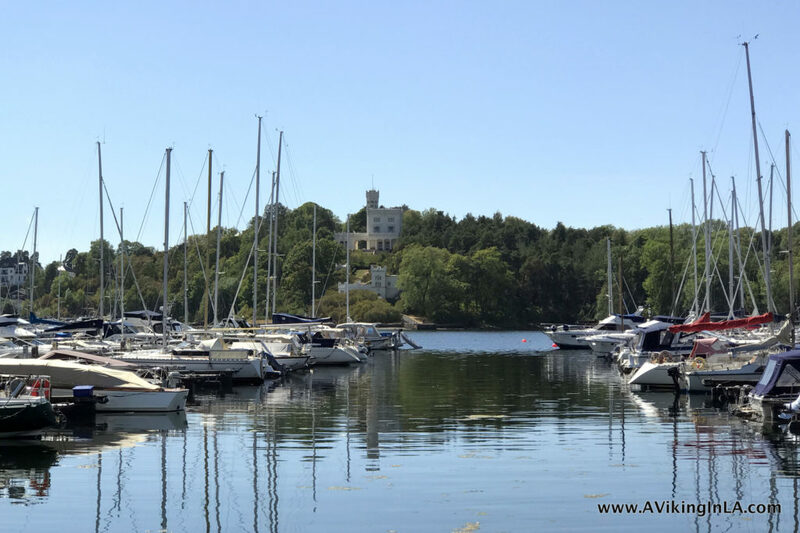 On the other side of the inlet on the Bygdøy peninsula, we spotted Oscarshall, the royal summer palace completed in 1852 and open to the public since 1881. 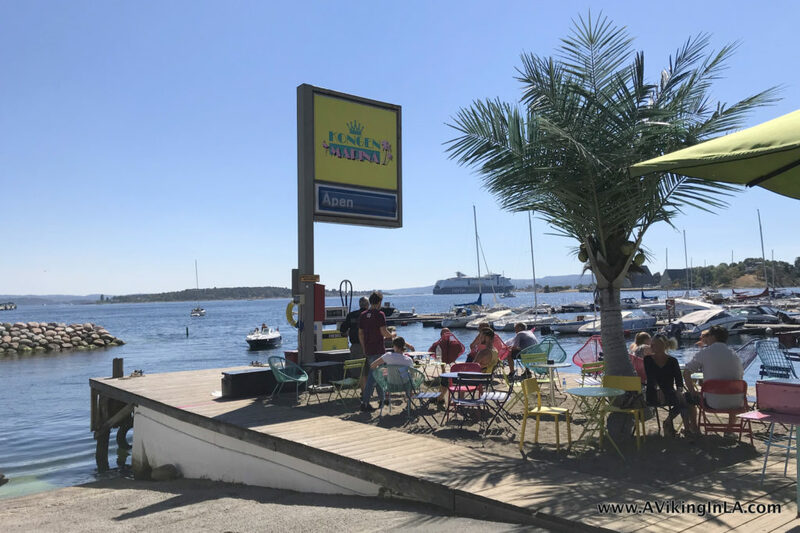 At Kongen Marina (Point #2), a tropical themed café awaited. It was a very welcoming and enticing place, but we had plans to eat lunch later on in our outing. It was too popular for me to search for the geocache that was there. Reluctantly, we continued on. The next stretch of the promenade, through Filipstad, was not as appealing. The path was right next to the motorway with only industrial buildings in sight. 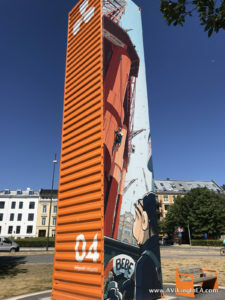 The comic book artwork on the orange towers did provide some fun diversion along the way, though. Also, at Point #3, I was able to easily retrieve a geocache since there were no people lingering. There are plans underway to develop this area into an attractive residential community which will make a huge difference! 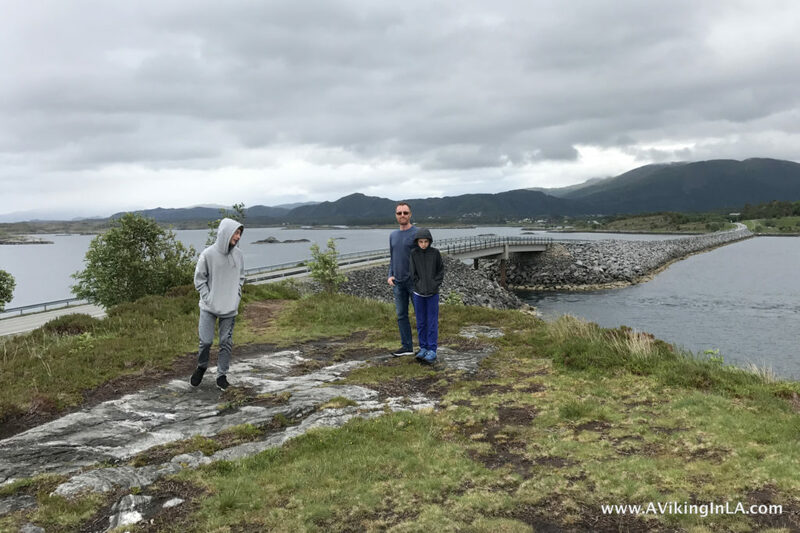 Luckily, this uninteresting stretch didn’t last too long and soon we were at Tjuvholmen which was a stark contrast to what we’d just encountered. 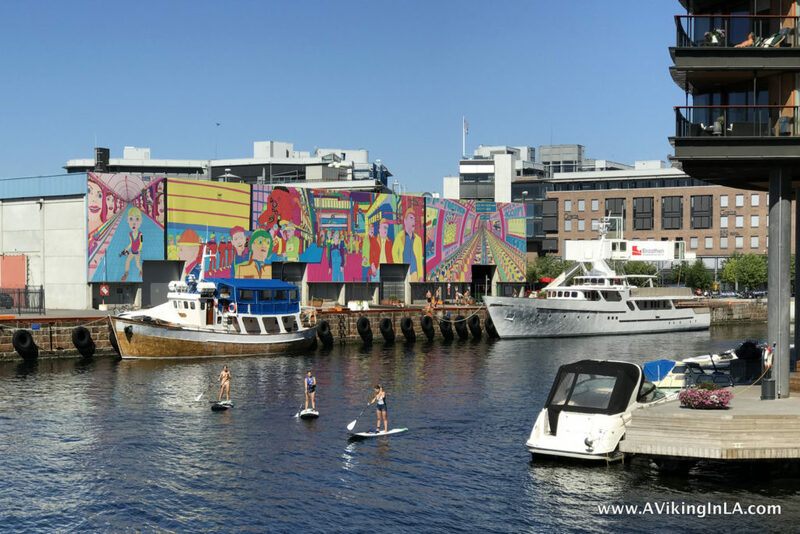 We were suddenly surrounded by a chic, happening waterfront with bright and bold artwork, modern architecture, and an active folk life. I could have just stayed there and people watched for hours. Any thoughts of more geocaching were quickly forgotten. We chuckled at how the area reminded us of Los Angeles’ Venice Beach! 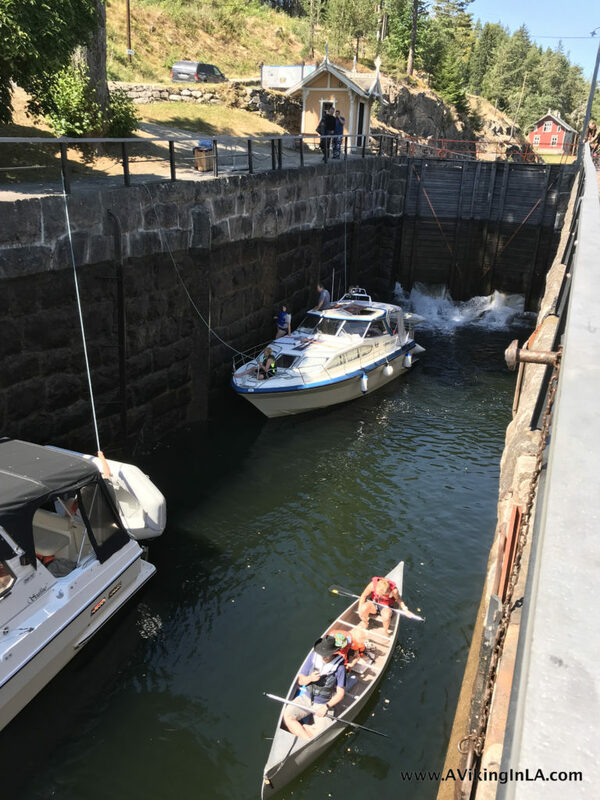 We already had the palms in mind from Kongen Marina. 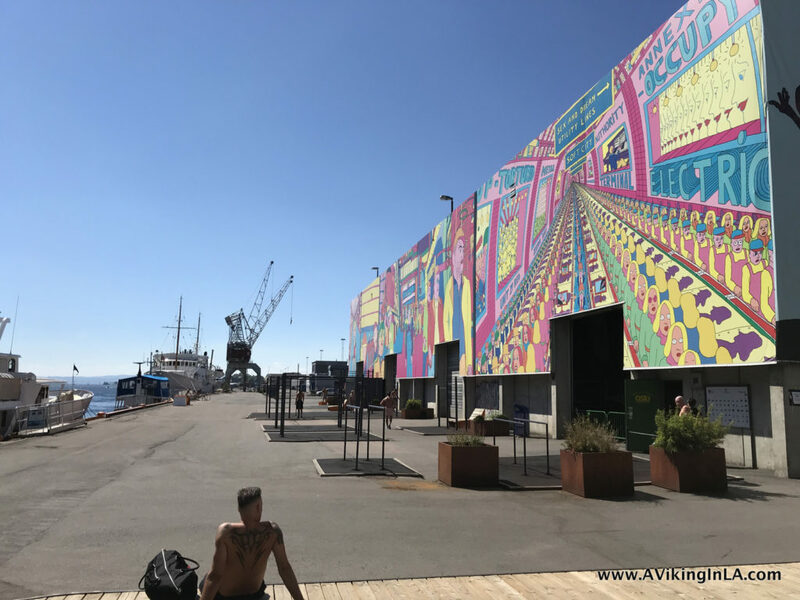 Now we saw huge wall murals (art by Norwegian pop artist Pushwagner, 1940-2018), an outdoor workout area (complete with bare chested men and bikini clad women! 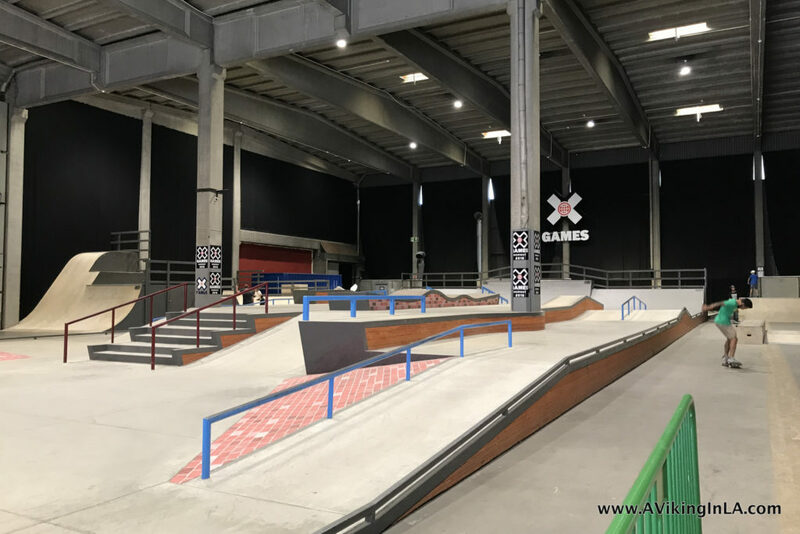 ), a skatepark (though indoors and practically empty because, as you’ll see, everyone is outside swimming! ), stand-up paddle boarding, sunning, and swimming. 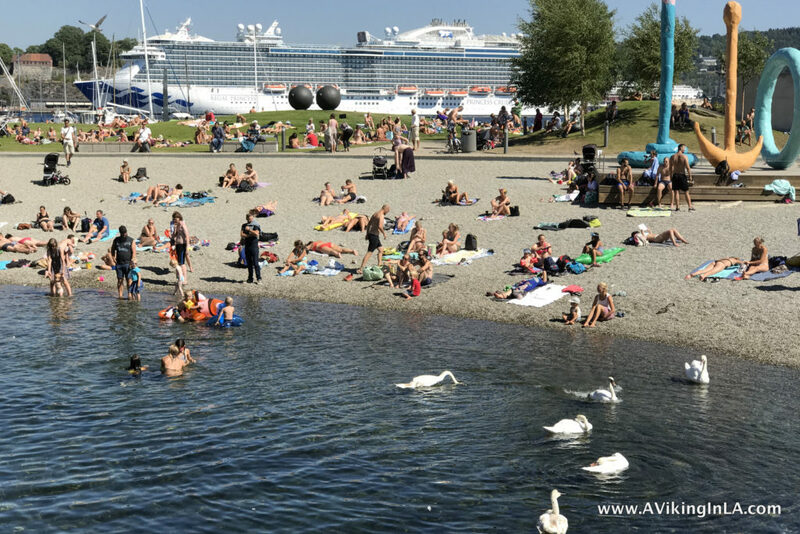 I was mesmerized by all the people swimming and hanging out by the edge of the fjord. 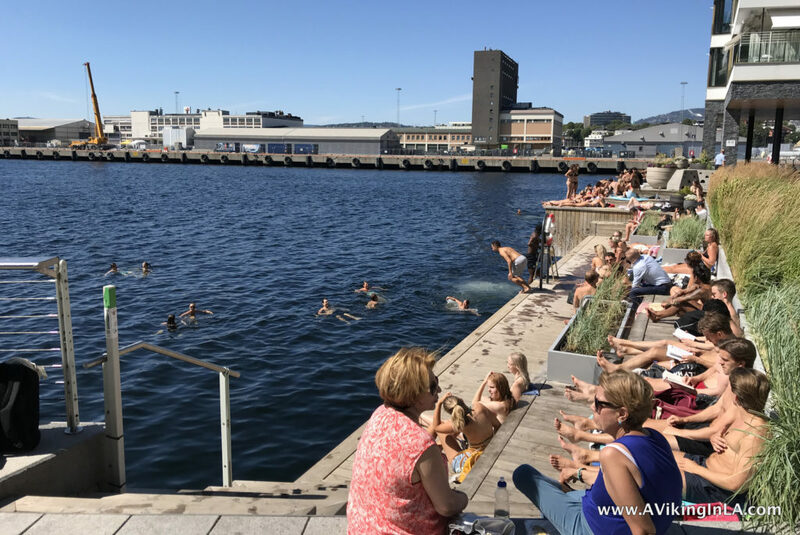 Oslo has been unseasonably warm and dry this summer and people were taking advantage. And this wasn’t even a weekend day. It was a Monday. 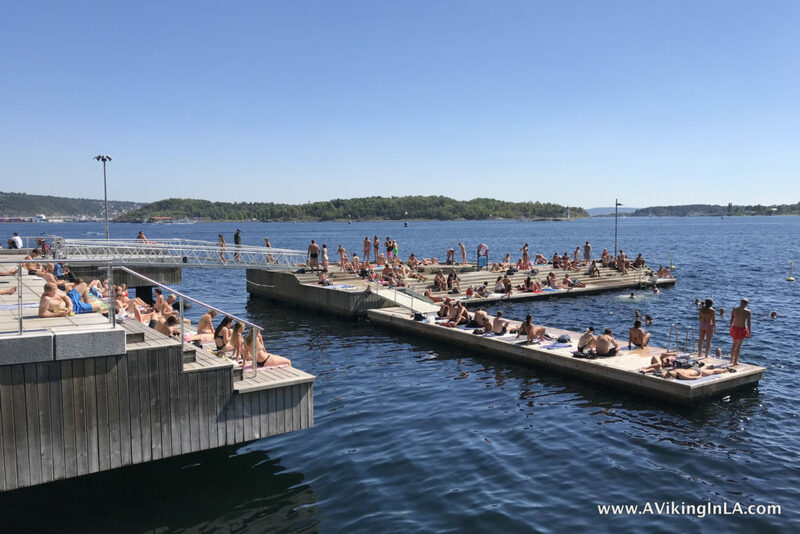 In addition to alluring outdoor spaces and fascinating architecture, Tjuvholmen is home to the modern art museum Astrup Fearnley Museet and an outdoor sculpture park. We lost sight of that with all the swimming going on, but they were there right next to the sandy beach. 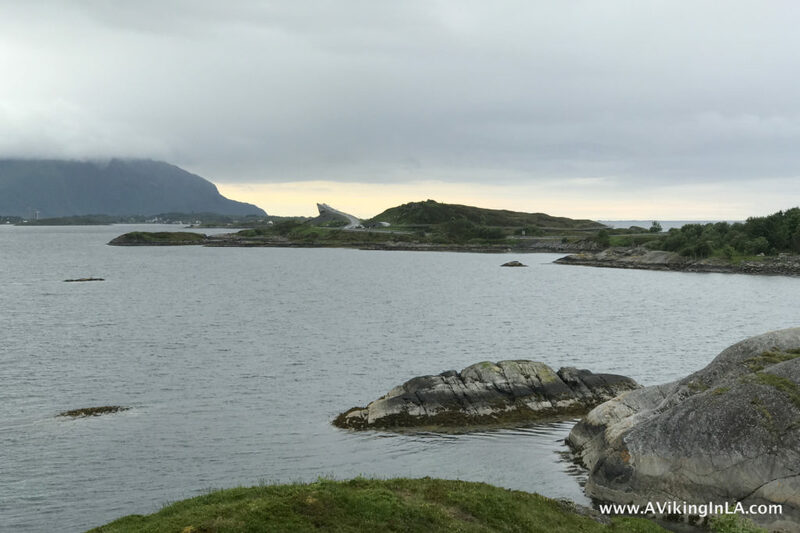 I realized too late that there is a lookout tower at Tjuvholmen as well, The Sneak Peak. 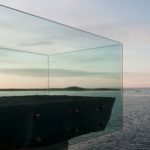 It has a glass elevator that takes you up 117 feet for 360º views of the city, bay, and fjord. We’ll have to remember that for next time. 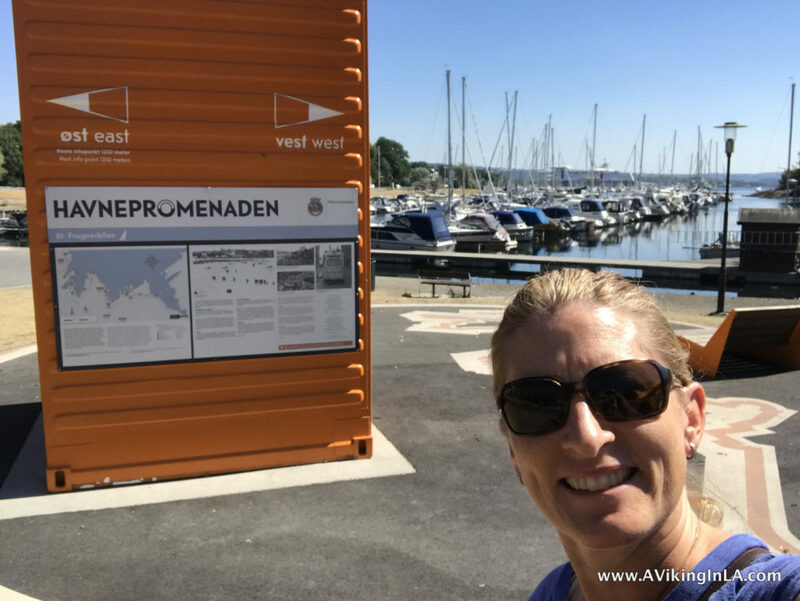 We wrapped up our promenade exploration just down the way at Aker Brygge (between Points #5 and #6 on the map), the original hotspot of the harbor area. 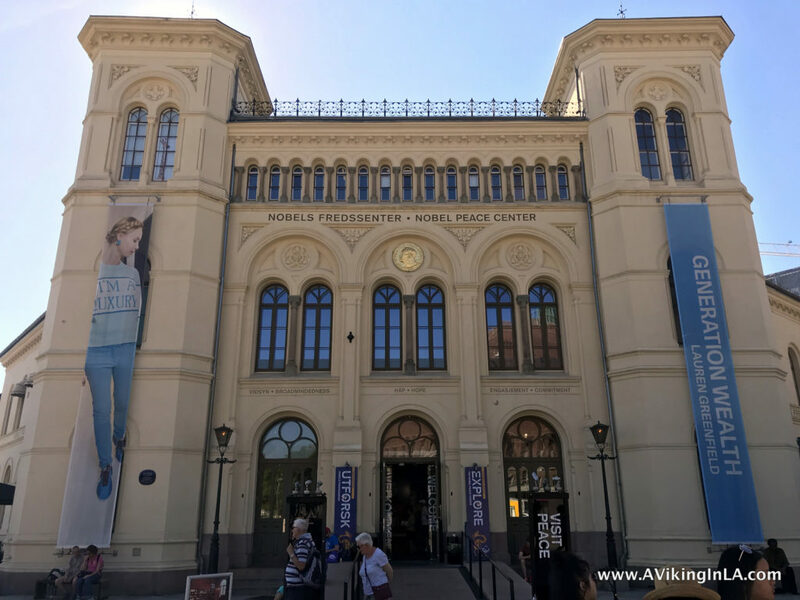 Besides dining, shopping, people and boat watching to your heart’s content, you can visit the Nobel Peace Center in this area. It was actually on my wishlist for this summer because they are hosting the exhibition Generation Wealth (until August 21, 2018) which I missed when it was here in Los Angeles, but sadly we ran out of time. We completed about half of the promenade this time around. The remaining stretch we’ll have to do next time we visit. Maybe we’ll do that with bikes since it brings us farther from home. 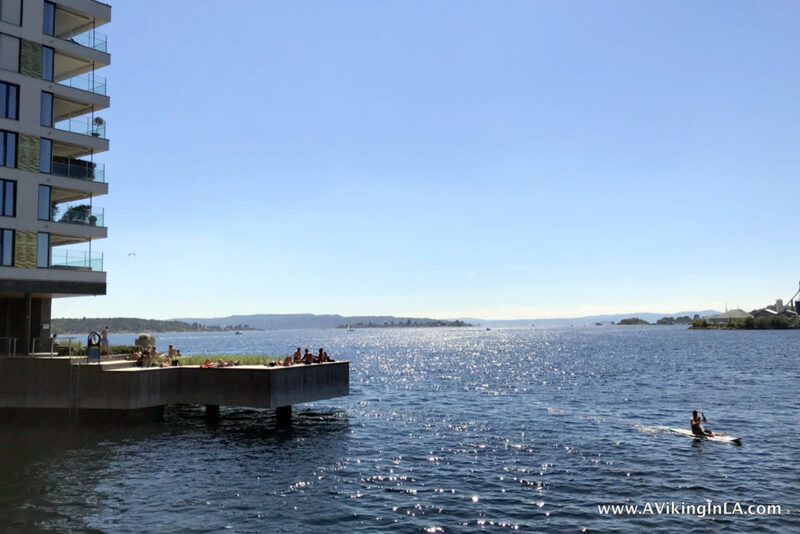 Exploring Oslo’s Harbor Promenade has been on my Oslo bucket list for a while so I’m glad I finally had a chance to begin. Seeing Vulkan Bee Garden at Mathallen was high on my wishlist for this summer’s visit to Oslo. These urban beehives are not your ordinary beehives. They are an art installation as much as a beehive. 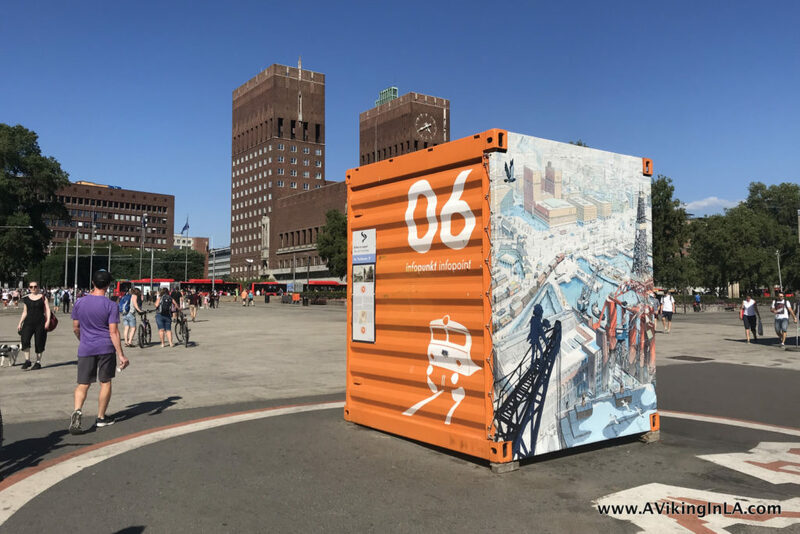 The Vulkan beehives were designed by Norwegian architecture firm Snøhetta, the same firm that designed Oslo’s National Opera House, New York City’s National September 11 Memorial Museum Pavilion, and so many other interesting projects around the world. 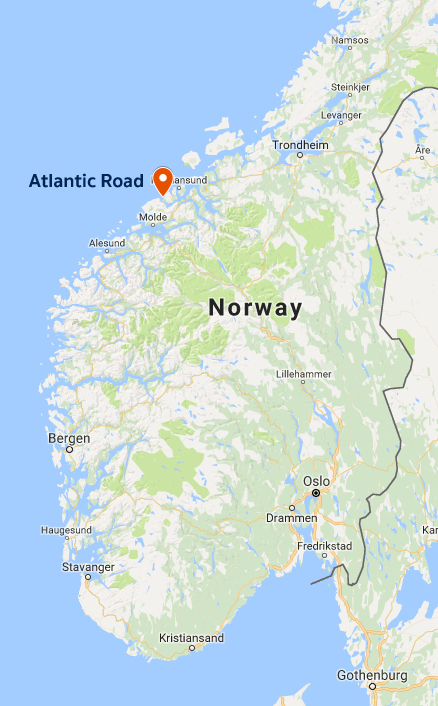 I remember reading about Oslo creating the world’s first highway for bees a couple of years ago and feeling great pride that my country was doing that. The bee highway’s aim was to “give the insects a safe passage through the city” by providing food and shelter as they traversed the city from one end to the other. This was not a government initiative, but rather one by ByBi, an urban guild of beekeepers. Participants in the project are varied – businesses, schools, associations, and private individuals. Everyone is encouraged to build bee-friendly feeding stations and accommodations in the city. The Vulkan beehives were installed in 2014. As explained by Vulkan on their page about the bee garden, “The natural honeycomb geometry was the inspiration for the form and pattern, along with the bees own production pattern; the hexagon-shaped cells bees store their honey in. Using a light colored wood with a finish that is honey in tone makes the hives look like big hexagon jars of honey.” Inside the structures are standard foam beehives. So I made plans to meet my aunt for lunch at Mathallen, a food court with specialty shops and cafes, and a lovely lunch we had. It wasn’t until we were on our way out that I discovered where the beehives were. Next time I’ll see about enjoying my lunch outside Mathallen instead so I can appreciate the beehives a little longer than just passing by. 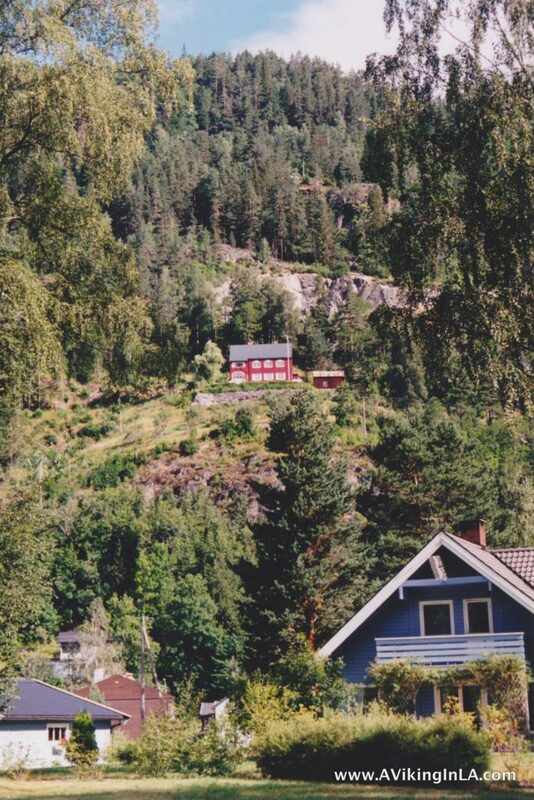 It would also be fun to buy some Vulkanhonning, honey from the Vulkan beehives, while I am there. 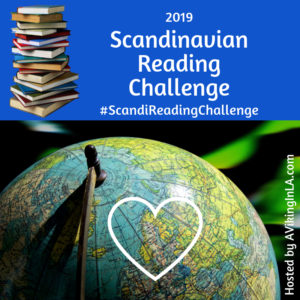 On a related bookish note, I am currently reading a Norwegian novel called Bienes historie by Maja Lunde that I highly recommend. It will be released in the USA as The History of Bees on August 22. 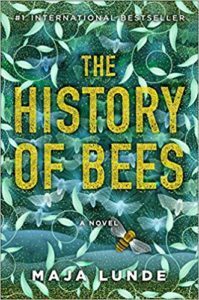 The novel includes three storylines which all revolve around the importance of bees, or lack thereof. 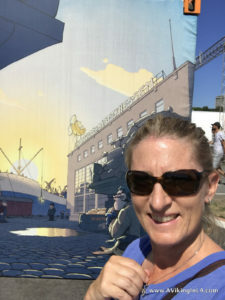 The first storyline takes place in England in the mid-1850s when beehives are being improved, the second one in USA in 2007 when there is an increase in the number of colony collapse disorders being reported, and the last one in China in 2098 when humans have had to resort to hand-pollination due to the total collapse of bees. I’m really intrigued by the book and am happy that English readers can also enjoy it soon. I encourage you to check it out. For some insight into the beekeeping at Vulkan beehives, here’s a short video. 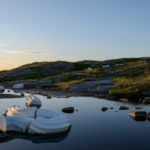 It is in Norwegian, but the images are worth your time. 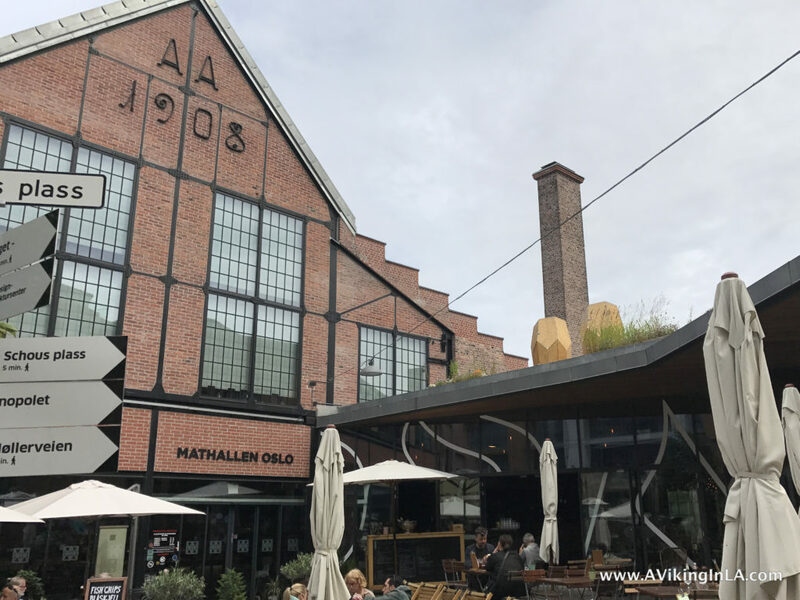 Are you headed to Oslo this summer, and maybe you’re looking for something besides the normal tourist sights? 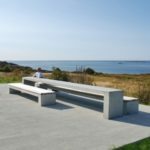 Here are some newer sights and hidden gems to consider. 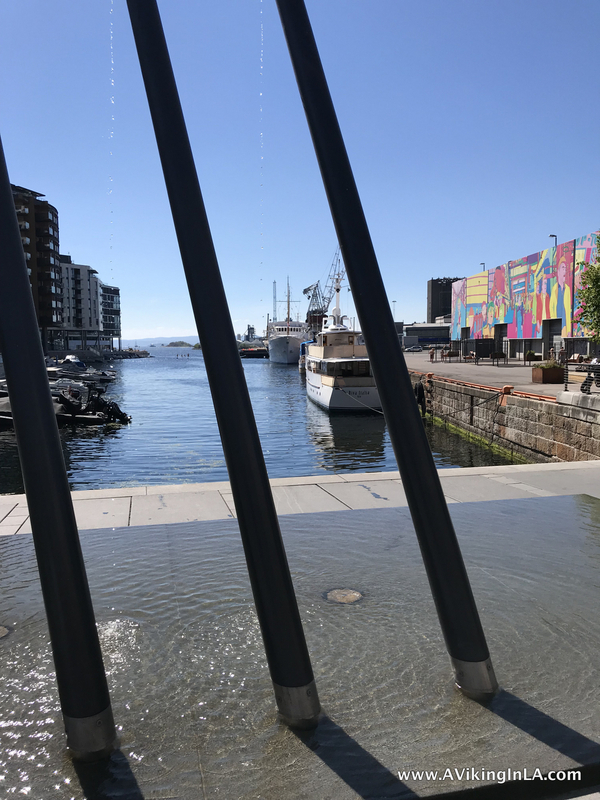 Oslo has a very new harbor promenade to explore. 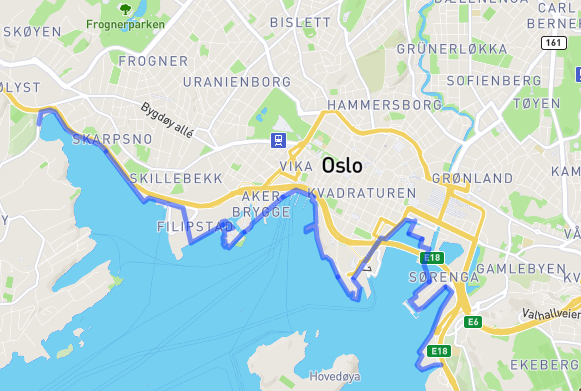 It runs 9 kilometers (about 5.5 miles) along the waterfront and hits many of the main sights of Oslo including Tjuvholmen and Aker Brygge, the inner harbor with City Hall and Akershus Fortress, and the Opera House. 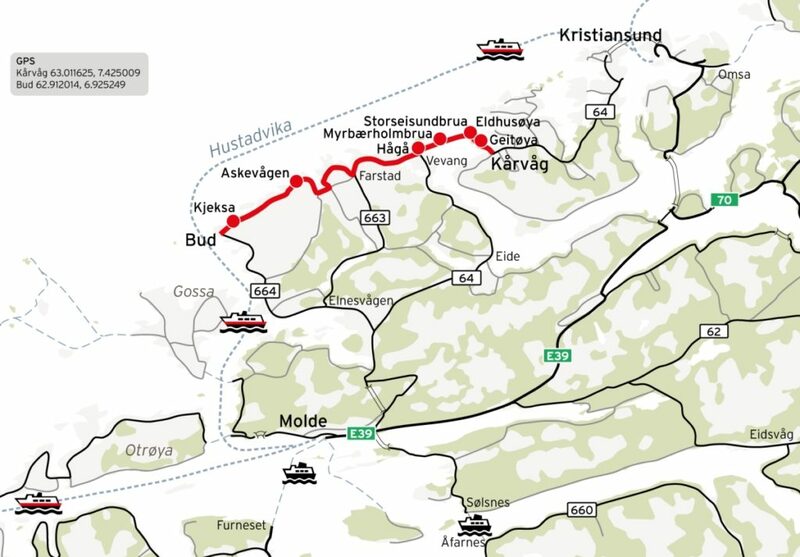 I look forward to exploring this route by bike with the family. I may finally have a chance to get a close-up look at the Opera House with its dramatic architectural features. 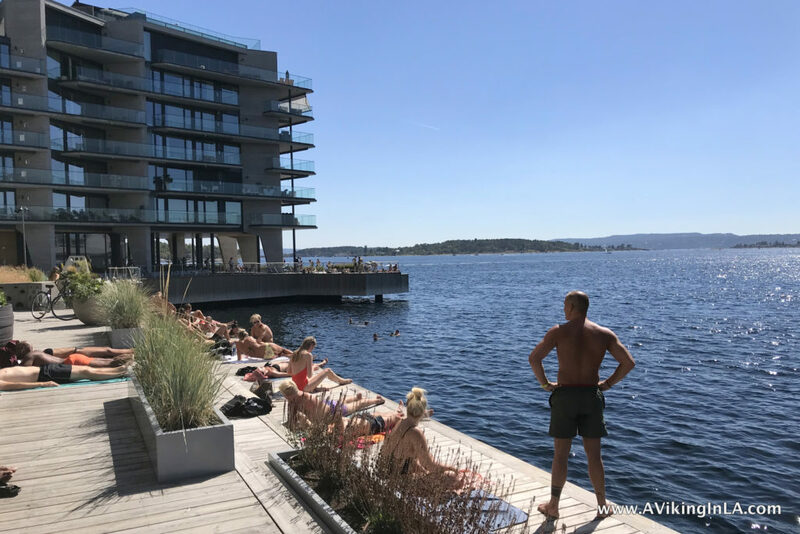 I also hope to include a swim at Sørenga Seawater Pool and a meal at Vippa (a huge warehouse recently named one of the “10 hottest new restaurants in Oslo” according to eater.com). 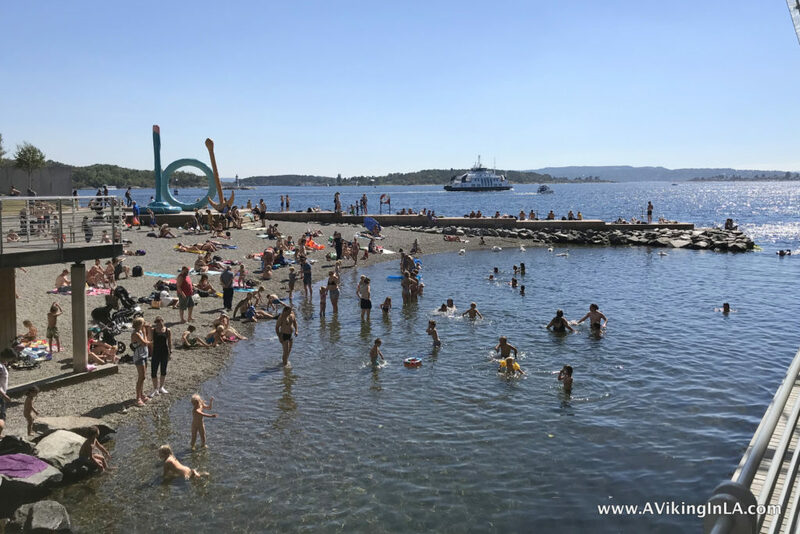 A few years ago, a cousin of mine recommended a visit to Hovedøya, an island a short ferry ride from the city center known for its beaches, forests, and cultural heritage sights. There you can explore the ruins of a Cistercian monastery from 1147. In 1532, the monastery was pillaged and burned down, and the ruins weren’t excavated until 1840’s. You can also see two canon batteries from 1808 and two gunpowder depots from when the island belonged to the Norwegian army. It would be a nice excursion on a day with beautiful weather. Bring swim gear and a picnic (or eat at one of the cafes) and spend the day exploring. 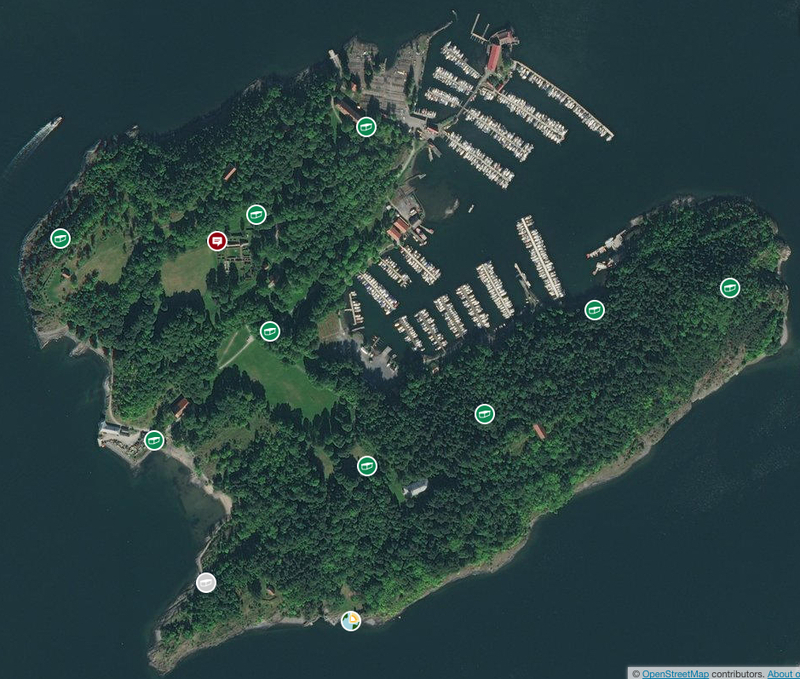 It also has plenty of geocaching opportunities (see map above with all the geocaches!) which is always a fun addition to an outing. 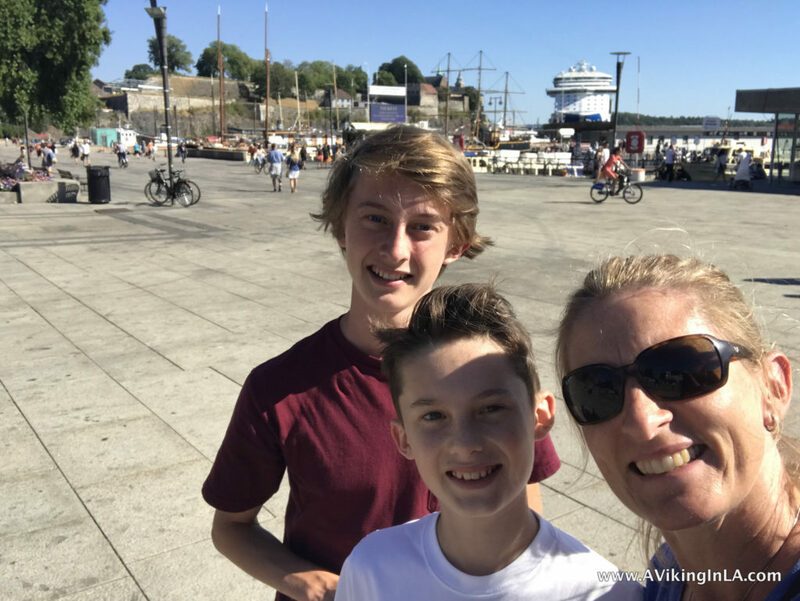 I have been to the Viking Ship Museum on several occasions, but somehow we have not yet managed to take the kids. 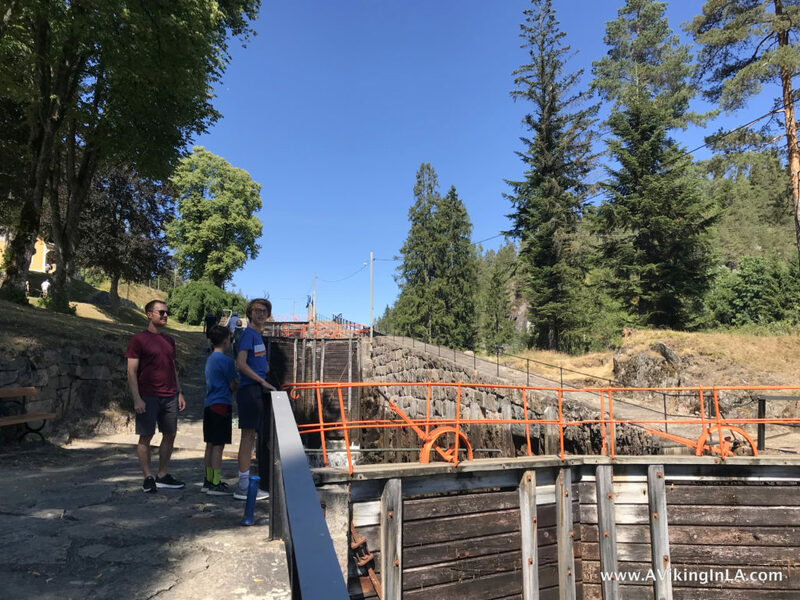 It used to be that the main attractions were three Viking ships, one of which is completely whole, along with a display of Viking Age artifacts. Now, there is a new attraction: the film Vikings Alive. It’s a film that takes the audience on a unique visual journey into the history of a Viking ship. A Viking ship is built and sails along the Norwegian fjords and on the ocean, ending its days as a grave ship for a king. The film is projected onto the vaulted ceiling of the museum. On our next visit to Oslo, this will be a must-see attraction. Museum of Oslo is another museum I’d like to take the kids to. 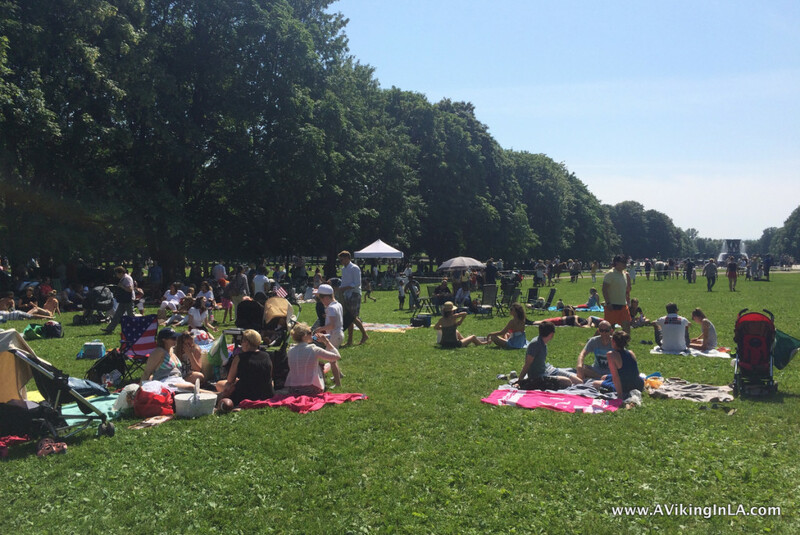 It’s located right in Frognerparken which makes it a convenient bike ride from my parents’ home. It presents the city’s history through models, paintings, and photographs. The museum’s exhibitions are mainly in Norwegian, but a free audioguide of “1,000 years in 20 minutes” is available in English, French, German, Somali, Punjabi, Polish, and Arabic as well as Norwegian. What piqued my interest in bringing the kids was that the museum offers a special family activity called City Detectives (recommended for kids age 5 to 12). 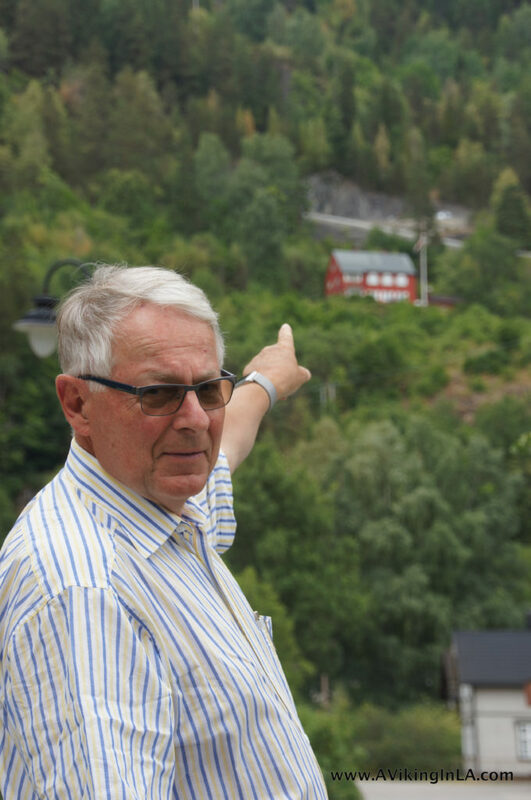 It’s an augmented reality app that allows visitors to get a glimpse of Oslo’s past. The goal is to find 10 historical stations in the exhibition “OsLove – City History for Beginners”. 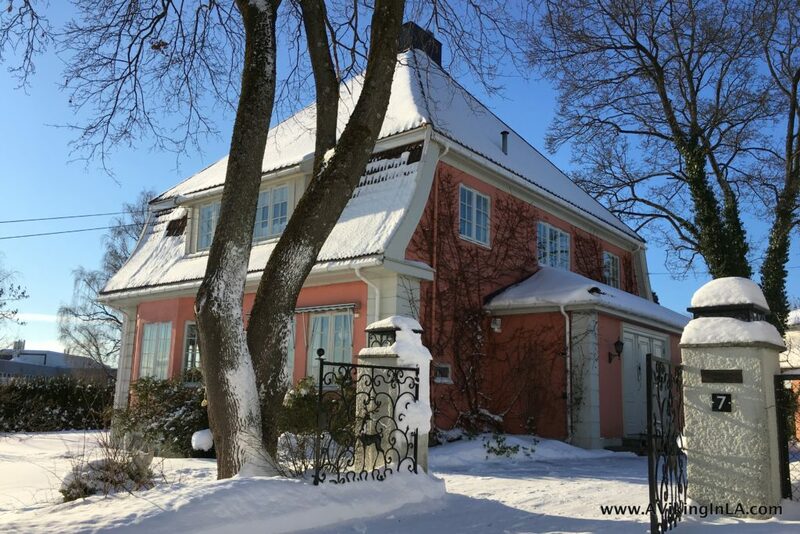 With the app, participants visit the 2-bedroom apartment of a big family, experience the power of Aker River, and see how the main street of Karl Johan has changed over time. The app is only available on site. You can borrow ipods or download the app to your own Apple device. 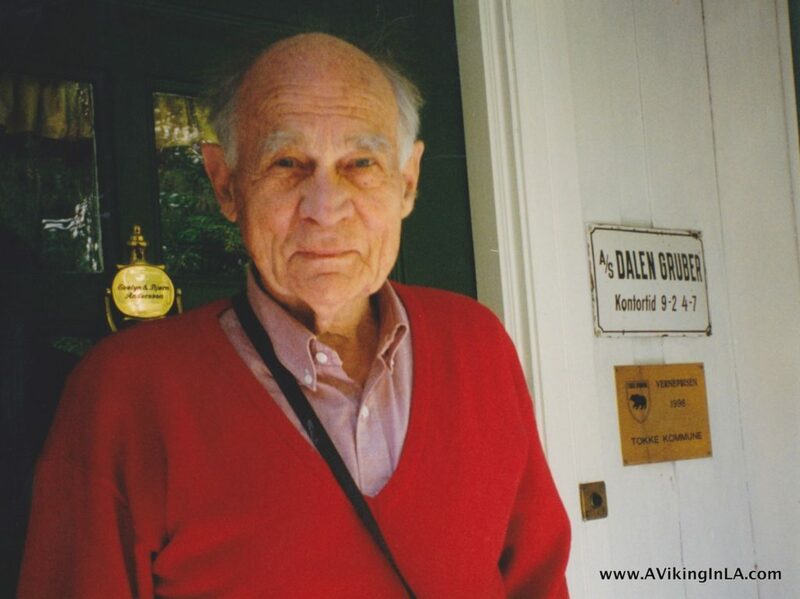 You do not need to know Norwegian to use the app. Every summer the Munch Museum puts on a special exhibit. 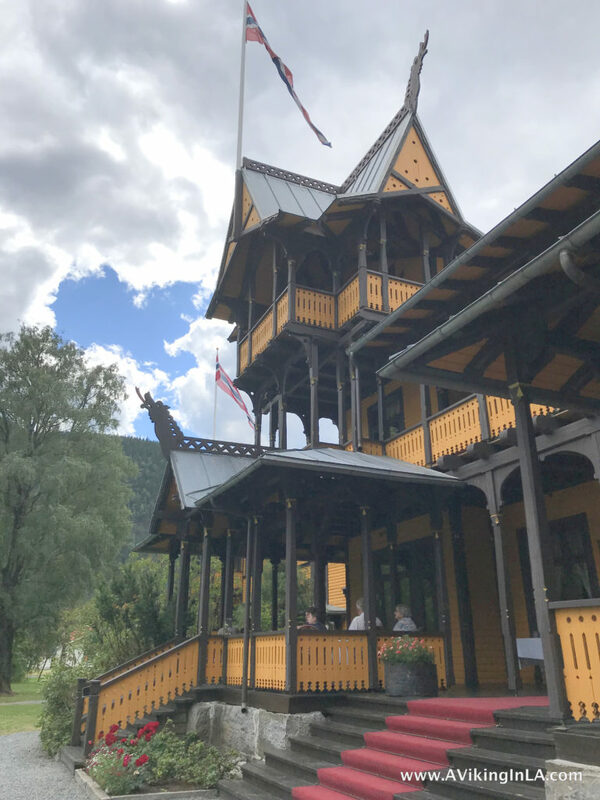 This summer visitors will have a chance to experience Edvard Munch as seen through the eyes of Norwegian author Karl Ove Knausgård. The exhibit, Towards the Forest – Knausgård on Munch, will feature many paintings, graphic prints, and sculptures that have never been exhibited previously. As described on the museum’s website, “the exhibition takes the form of a journey from light and harmony through darkness and chaos – returning finally to a controllable reality.” I’ve read and enjoyed Knausgård and like Munch so I’m curious to see this exhibition, something probably done more enjoyably without my children. Exhibit is on display from May 6, 2017, to October 8, 2017. 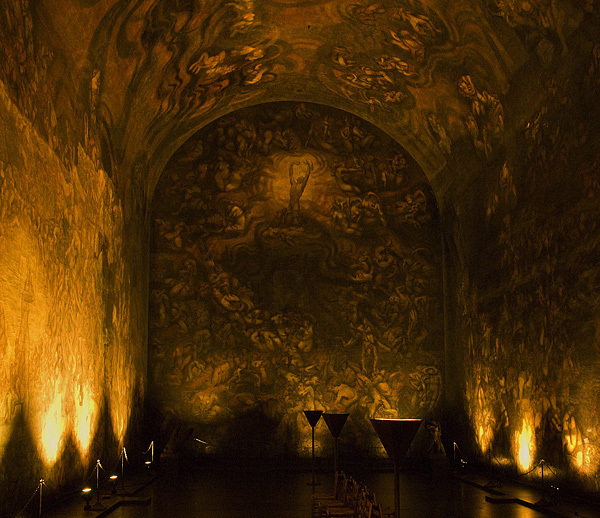 I learned about Emanuel Vigeland Mausoleum from the book Atlas Obscura: An Explorer’s Guide to the World’s Hidden Wonders. 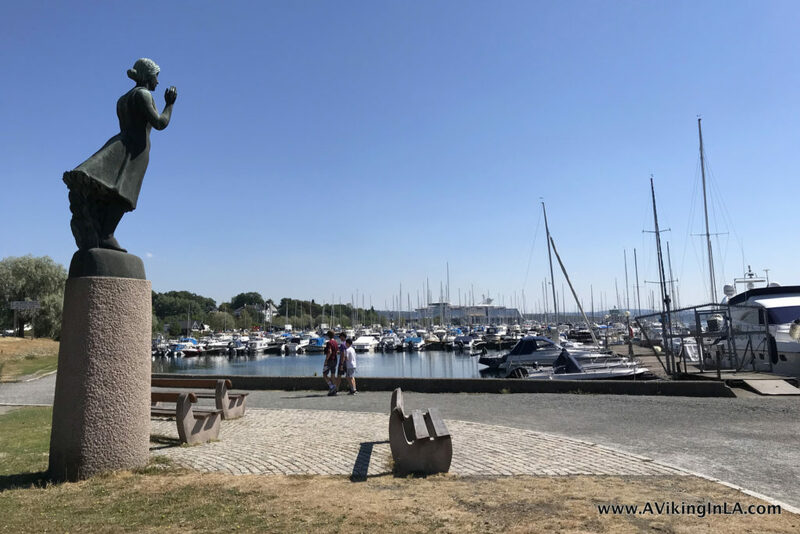 We are certainly familiar with the work of his brother Gustav Vigeland whose bronze and granite sculptures are on display in Frognerparken, but I did not know about Emanuel. 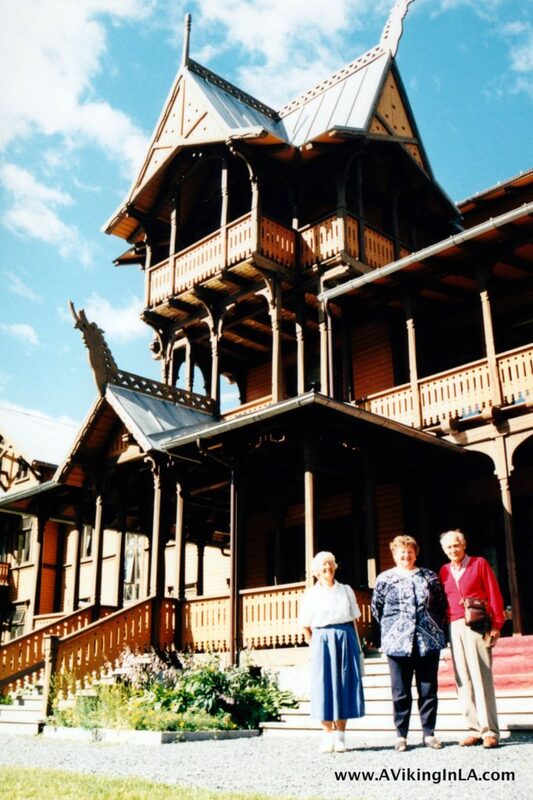 Damstredet and Telthusbakken are two roads known for their well-preserved and inhabited wooden houses built in the late 1700s and the 1800s. 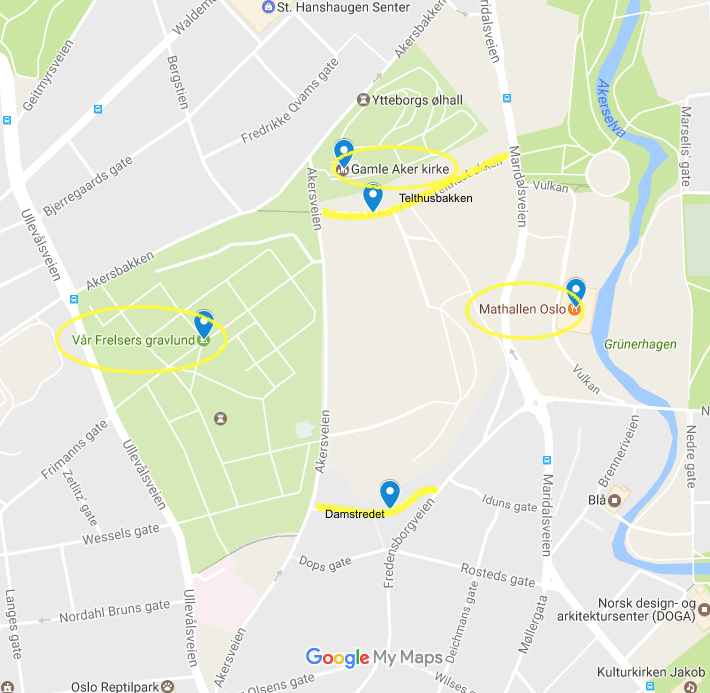 They are located near each other in the St. Hanshaugen/Gamle Aker area in central Oslo. 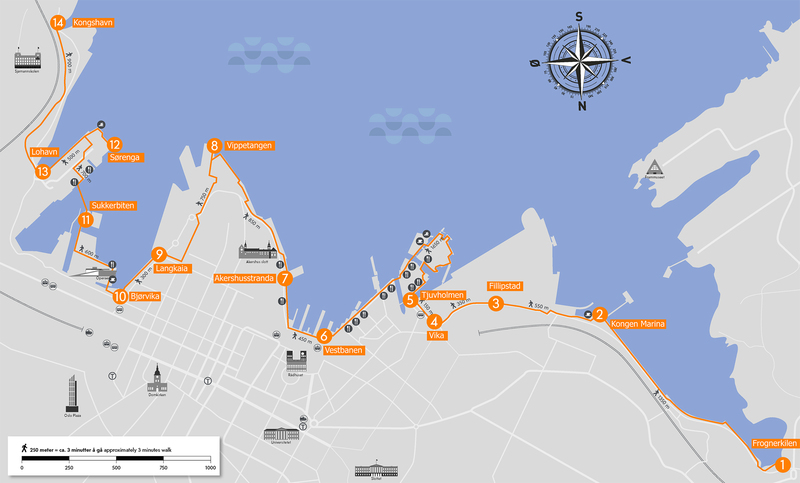 There are other sights in the area as well, so a visit to the area can make a worthwhile self-guided walking tour. 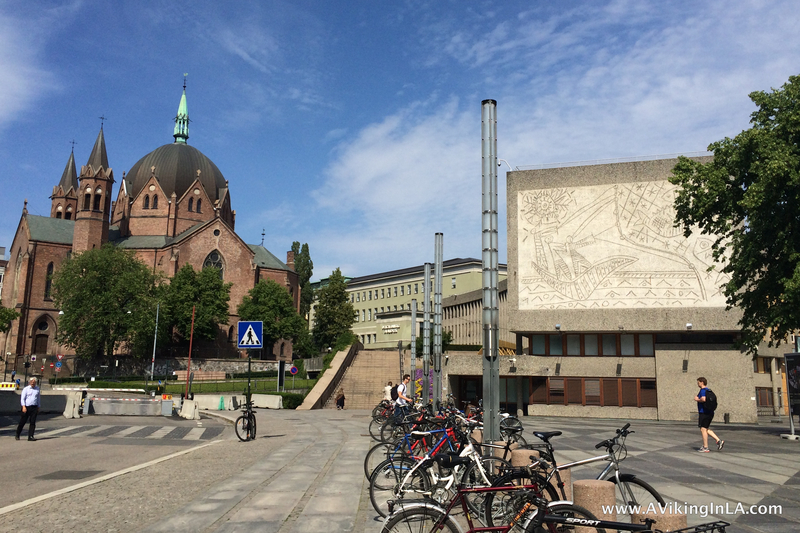 Very nearby is the medieval church Gamle Aker kirke (Old Aker Church), oldest building in Oslo, as well as Vår Frelsers Gravlund, the cemetery where writer Henrik Ibsen and painter Edvard Munch are buried. This excursion is easily combined with visit to nearby Mathallen, an interesting food court with specialty shops and cafés. 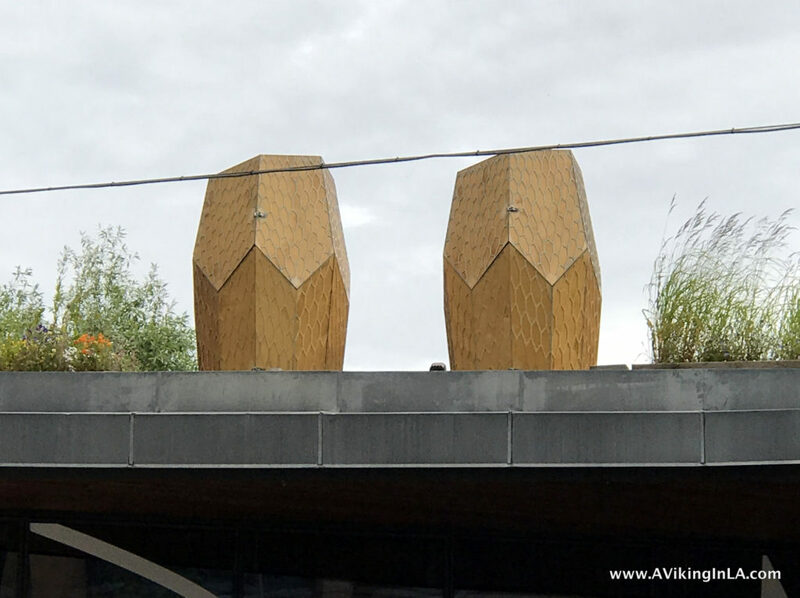 And while at Mathallen, you can see if you can spot the Vulkan Bee Garden, which is two huge beehives on the rooftop between Mathallen and Dansens Hus next door. 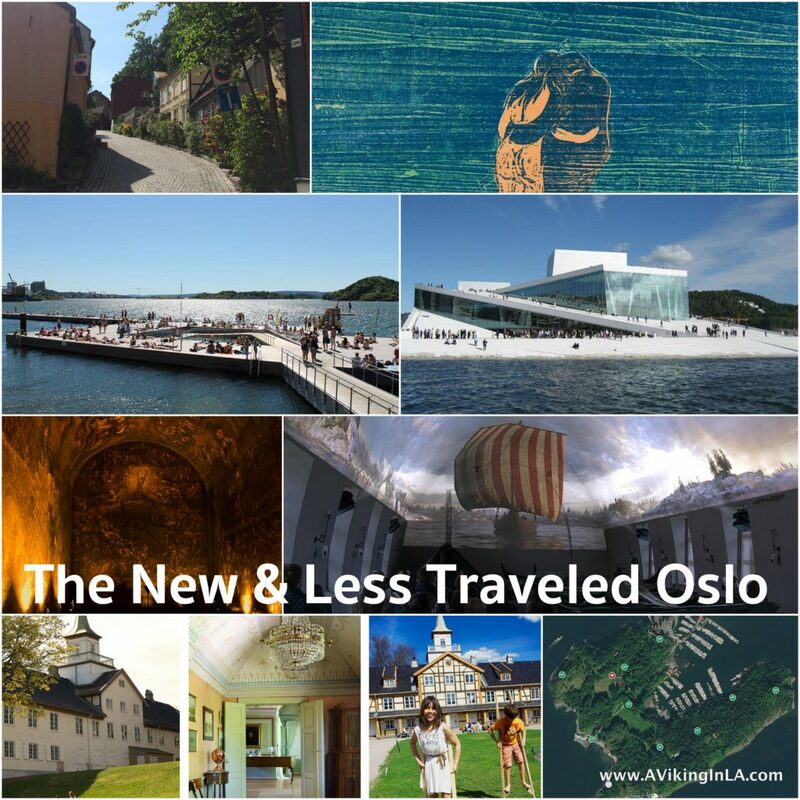 Stay tuned for a report on how our exploration of these new-to-us places and hidden gems of Oslo goes! 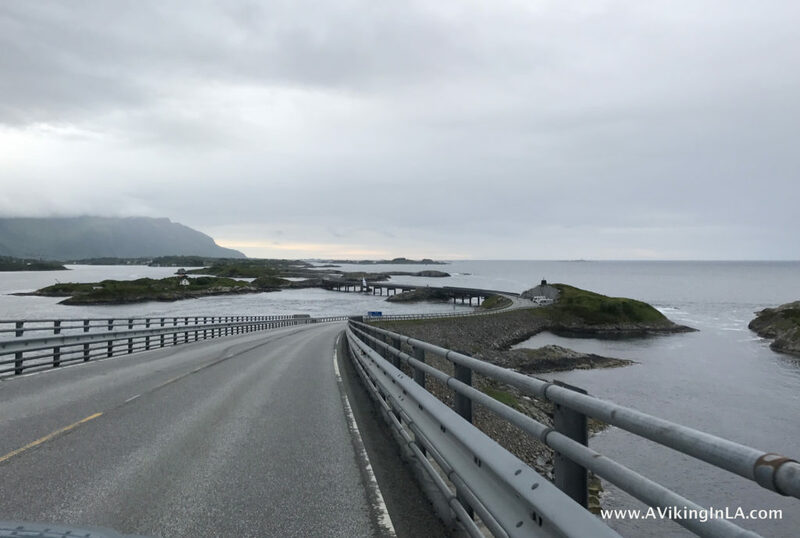 In August 2016, Netflix introduced Norway’s Slow TV to American viewers. I was curious about the Slow TV phenomenon that had enthralled Norwegians and now had arrived in the US. According to Wikipedia, Slow TV is “a term used for a genre of live ‘marathon’ television coverage of an ordinary event in its complete length.” What I quickly learned was that not all the Netflix Slow TV offerings were true Slow TV. Some of the episodes were actually segments of a much longer original broadcast or documentaries of live broadcasts. I also learned that there are different sub-genres of Slow TV. Some are meditative and relaxing; others are informative and entertaining. 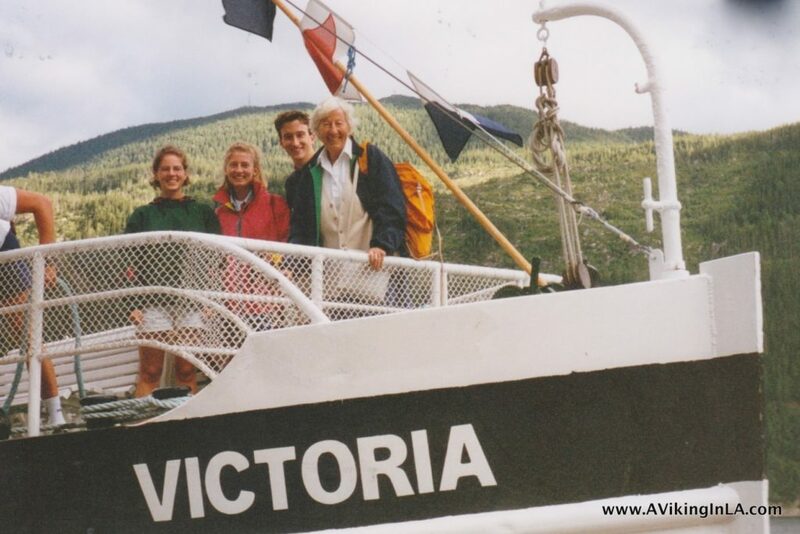 Read on for an overview of Netflix’s Slow TV offerings. Don’t have Netflix? You’ll find links to the programs elsewhere on the internet at the end of the post. 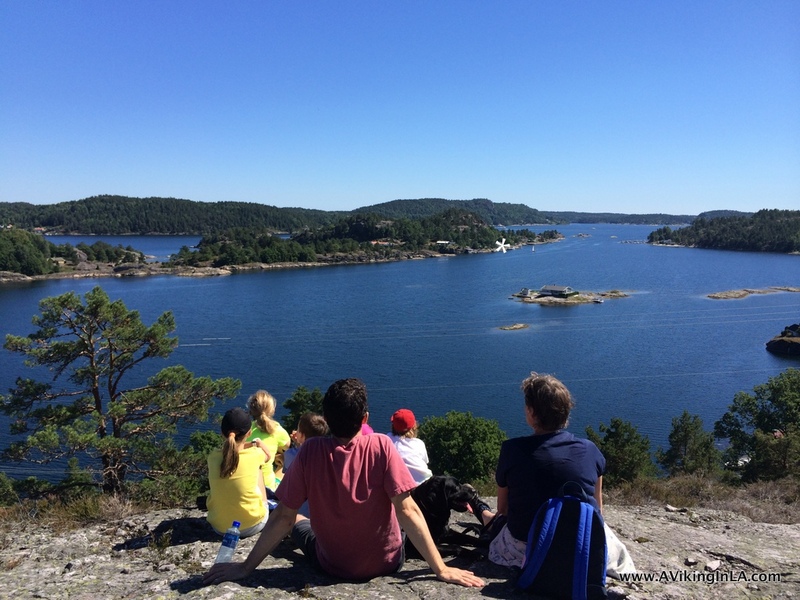 A new favorite activity during our annual summer trip to Norway is exploring Kyststien i Kragerø, a hiking trail through the municipality of Kragerø following the coastline as much as possible. Our summer home is on an island, but the trail passes right by on the mainland a very short boat ride away. 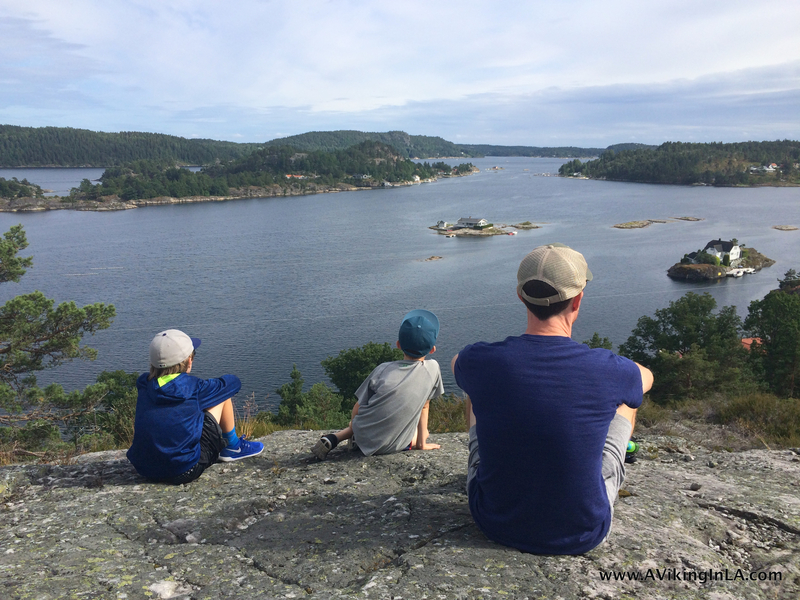 The Coastal Trail in Kragerø is a relatively new part of our summer consciousness. 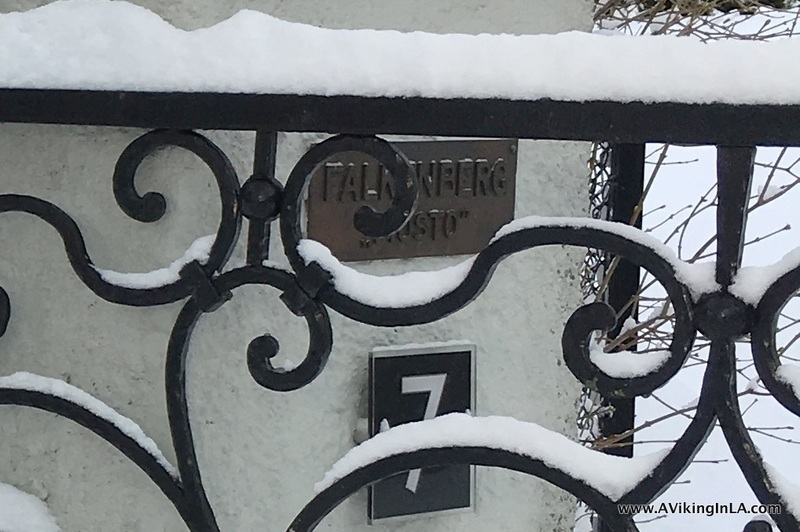 It officially opened in November 2013, so this year was our third summer with it. 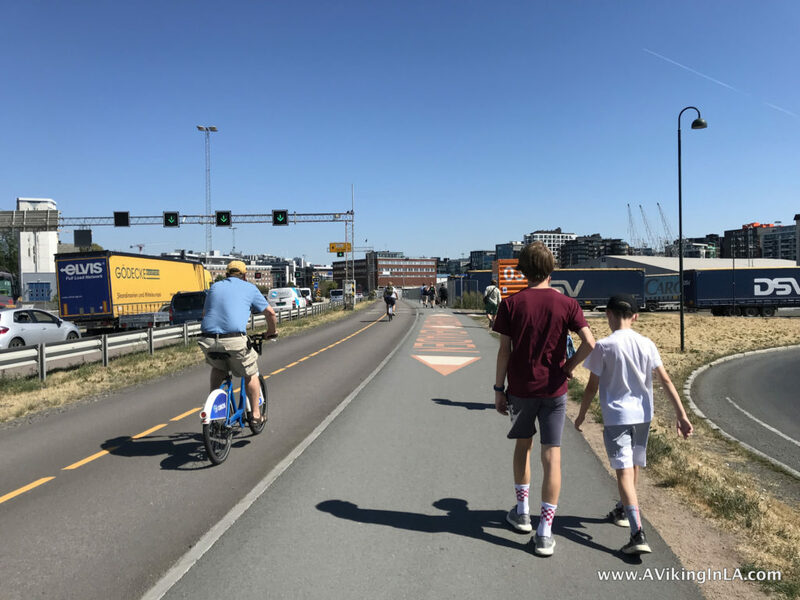 It’s part of an effort to have a continuous trail all the way from Oslo to Stavanger. 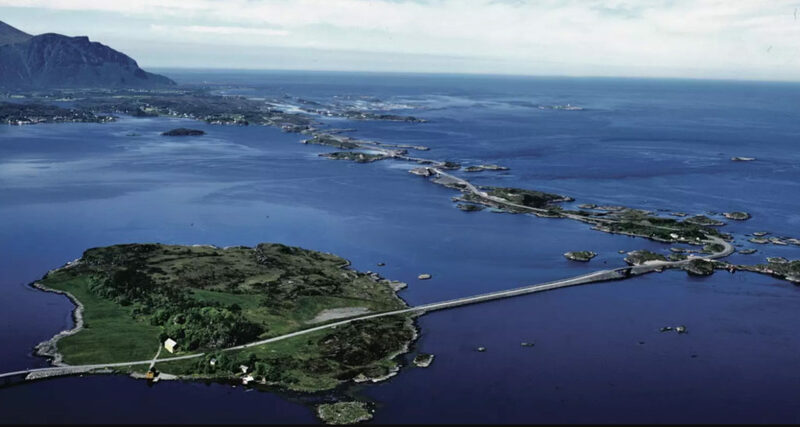 The idea was to use the old road system that once followed the coastline. 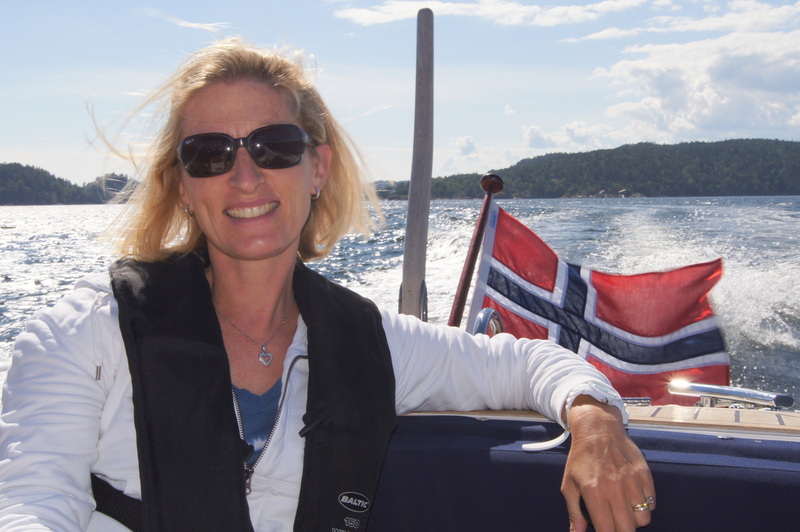 I always make a point of celebrating Norway’s national day, the 17th of May, here in Los Angeles. 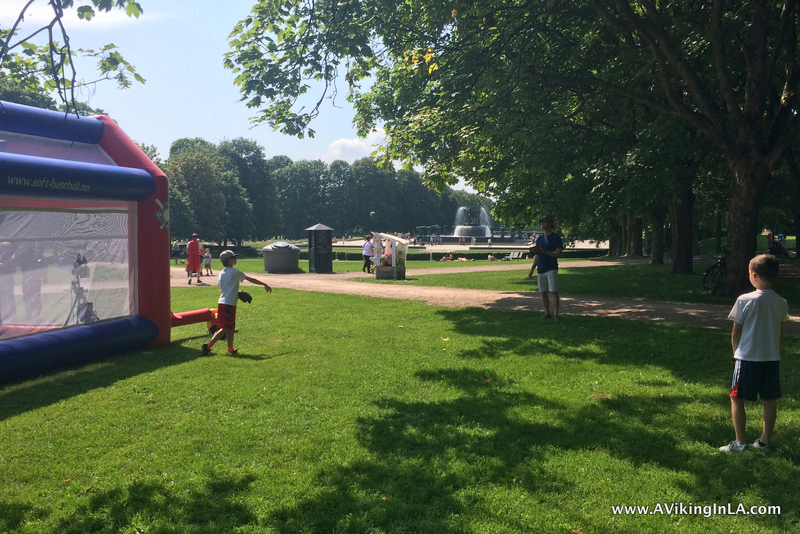 This summer I actually had the chance to do the opposite, celebrate USA’s national day in Oslo. 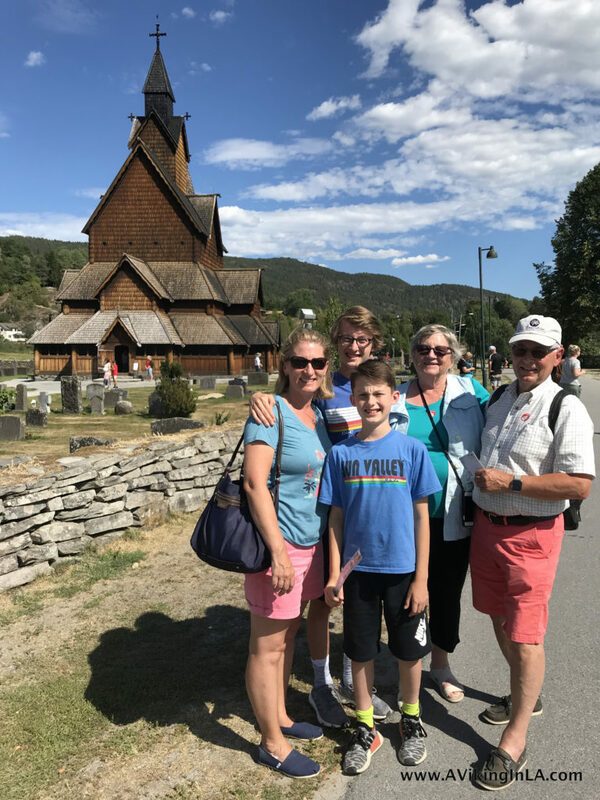 Having experienced Norwegian culture on display in Los Angeles, I thought it would be interesting to see what aspects of American culture would be highlighted abroad. 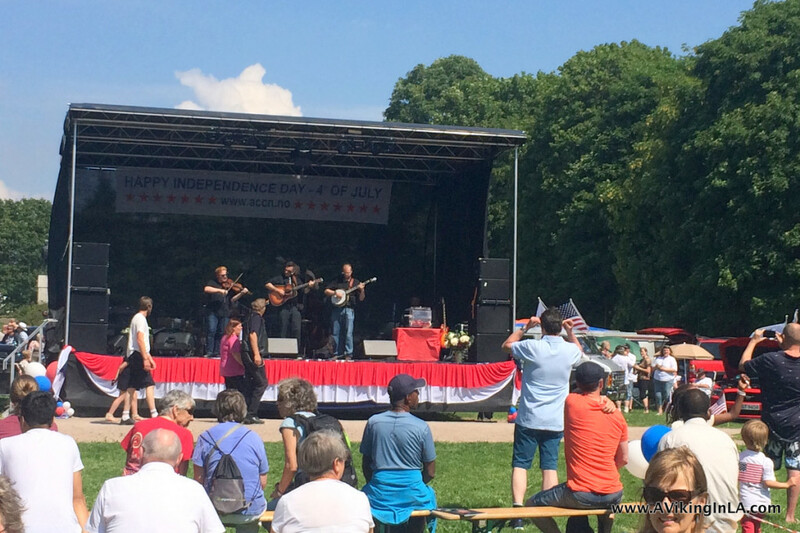 Every year the American Coordinating Council of Norway (ACCN) organizes an Independence Day Celebration in Frognerparken. 2015 was actually the 30th anniversary of the event. The celebration started off with all due pomp and circumstance with Opening Ceremonies where the acting ambassador (since the US has had trouble finding a qualified candidate) had some opening remarks and the Marine Guards from the US Embassy presented the colors. 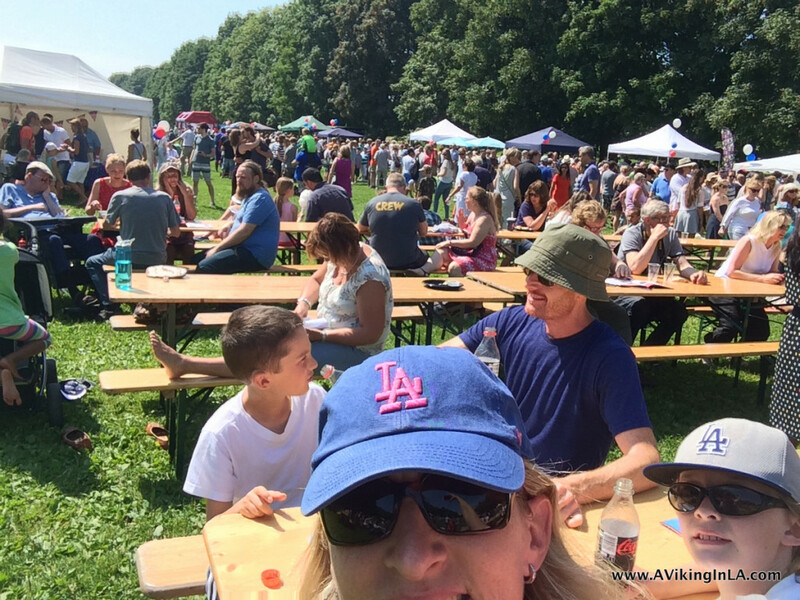 Then the day proceeded with folks visiting vendor booths and activity areas, browsing a classic American car exhibition, and enjoying American food, all while they were entertained by live entertainment on a big stage in the middle of it all. A Norwegian bluegrass band was on stage first and a rock band continued later with Norwegian cheerleading squads performing in between. Sonny and Doobie were immediately drawn to the American sports area where baseball and football were featured. We were given gloves and balls for a lesson in how to throw and catch a baseball. We chuckled when the volunteer started to explain since baseball is a sport we’re quite familiar with. She seemed relieved when she didn’t have to explain any more. 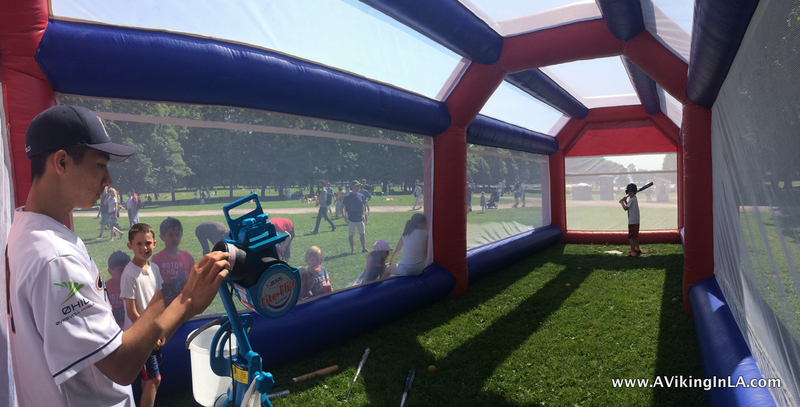 When the batting cage opened, the kids were quick to get in line. They were a little disappointed, though, since the pitches were very weak and low, and they weren’t able to show off all they could really do. 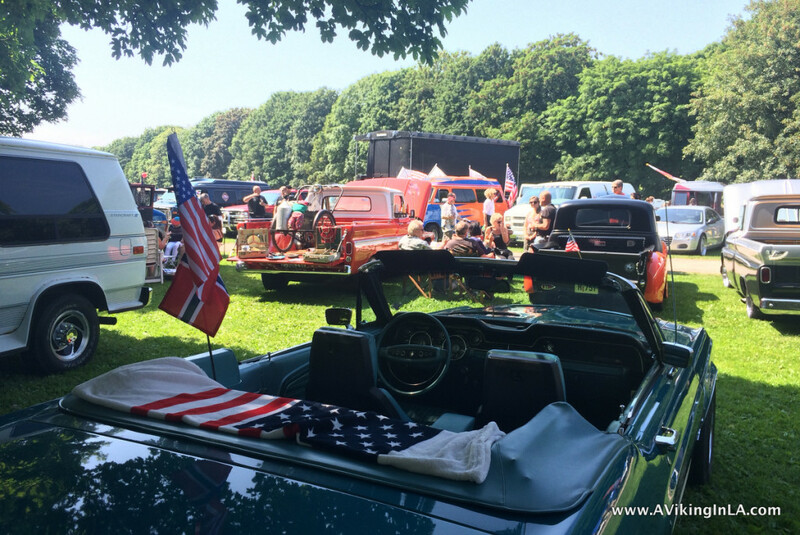 The American classic car exhibition took up as much space as the rest of the festival. There was an interesting and varied assortment of cars and trucks. We especially enjoyed the ones with unique paint jobs and interesting interior detailing. There was something for everyone to enjoy. We ended up at Domino’s Pizza (which I learned first opened its doors in Norway in August 2014), not the most exciting for us but it had the shortest line. To drink we had none other than American Coca-Cola, and for dessert, Ben & Jerry’s ice cream. There was a baked goods booth, too, of course. 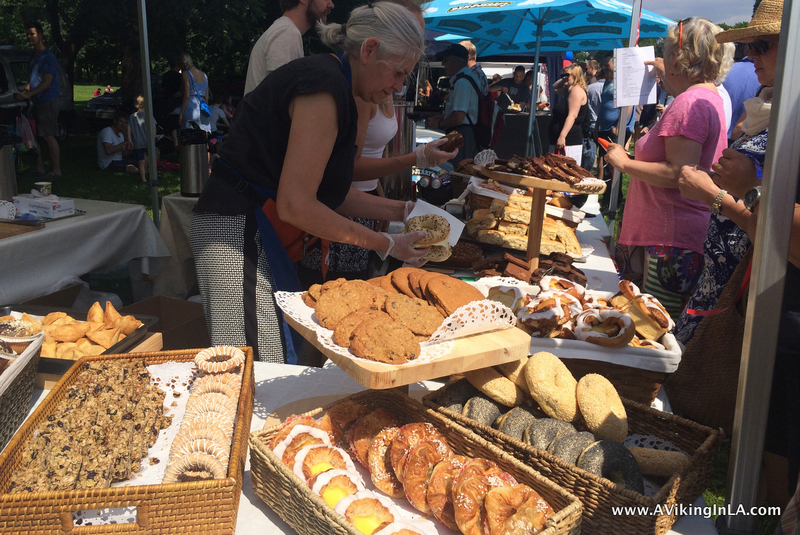 I thought it funny that they included Norwegian specialities in addition to the bagels, cookies, muffins, and brownies. Apparently, there was a cotton candy stand too, but we missed that. And a watermelon eating contest which happened after we had left. 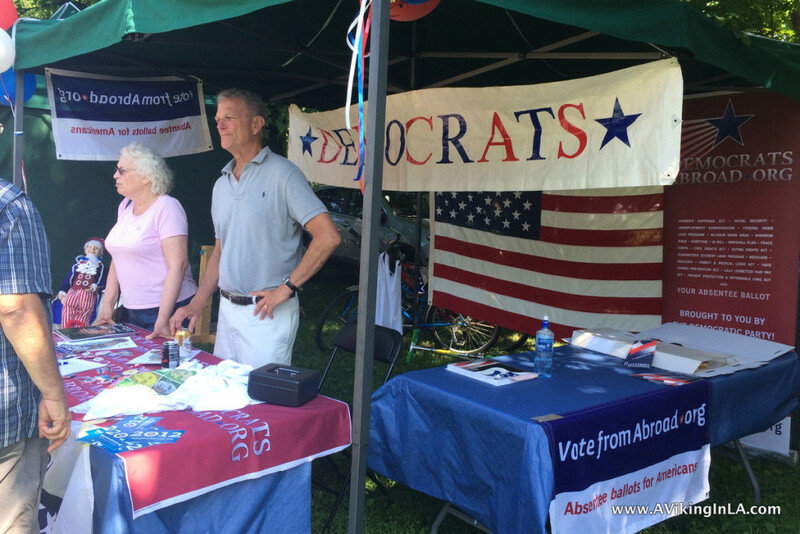 In addition to indulging in American food favorites and admiring classic cars, folks could discuss politics at the Democrats’ and Republicans’ booths and browse the used book booth for their next English read. 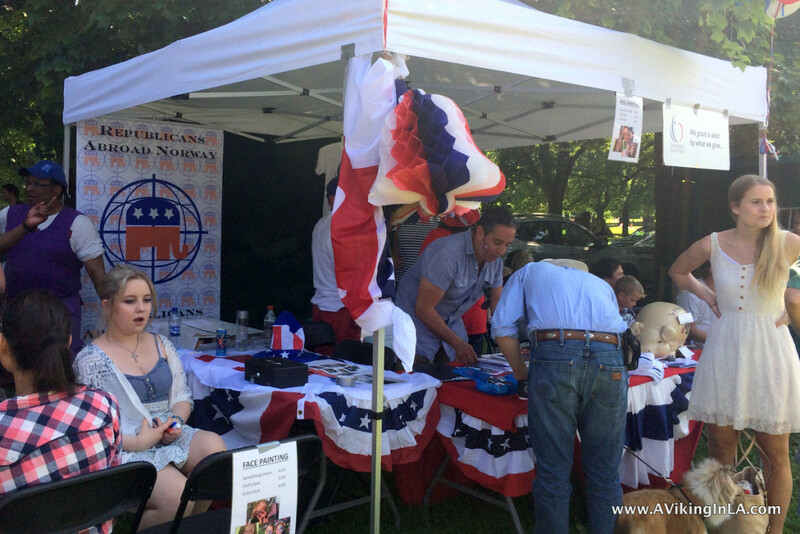 And kids could have pony rides and participate in hands-on activities provided by Oslo Children’s Museum. 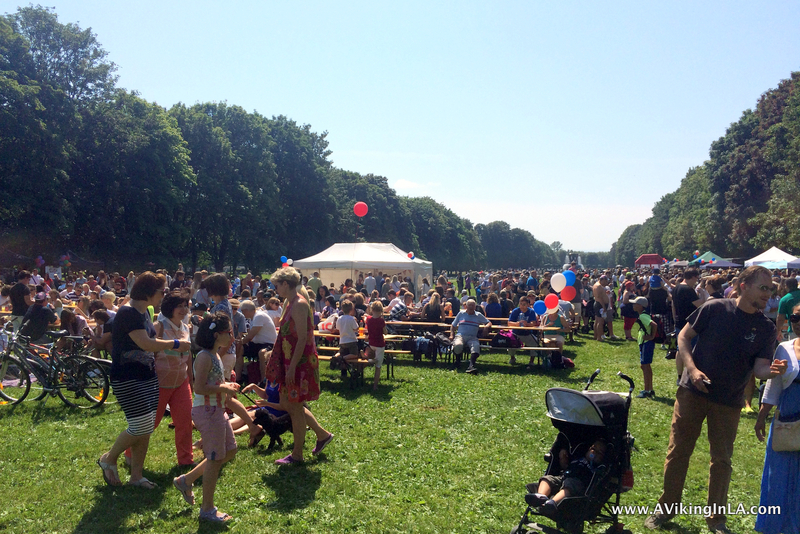 The ACCN made sure to have something of interest for visitors of all ages and nationalities. I’m sure American expatriates and folks interested in American culture were thrilled at all the offerings. A highlight of the festivities was the raffle ticket sales and drawings. There was an impressive list of prizes, and the sale of raffle tickets was brisk. 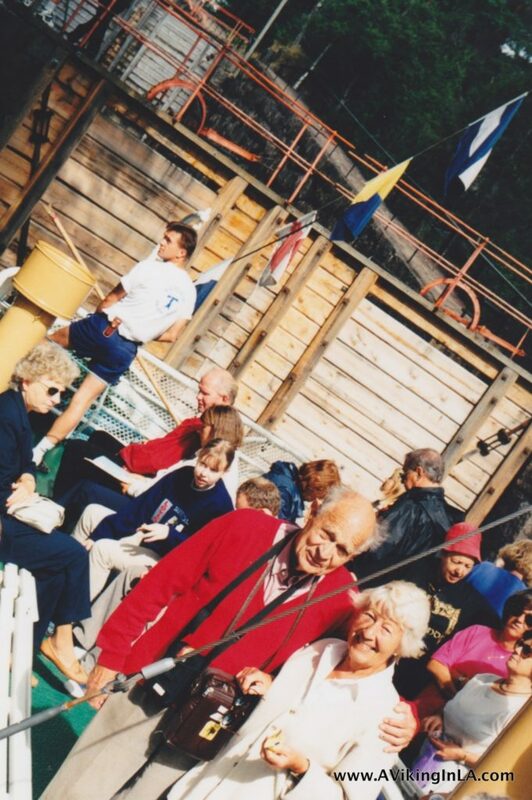 Grand prizes were 2 sets of round-trip tickets from Oslo to USA. Other prizes included a hotel stay, food and candy (from Heinz, Wrigley, Mars, Kellogg’s, Coca-Cola just to name a few), restaurant certificates, vacation tour tickets, and various other gifts and services. For those who wanted to guarantee a win, there was an instant win Lucky Wheel, and this appealed more to Sonny and Doobie. They were thrilled to walk away with Pringles cans and an assortment of American candy (and relieved that they didn’t win Heinz ketchup and BBQ sauce bottles). It was a fun and relaxing outing to the park, especially since the park was so close to my parents’ home and we could ride our bikes. 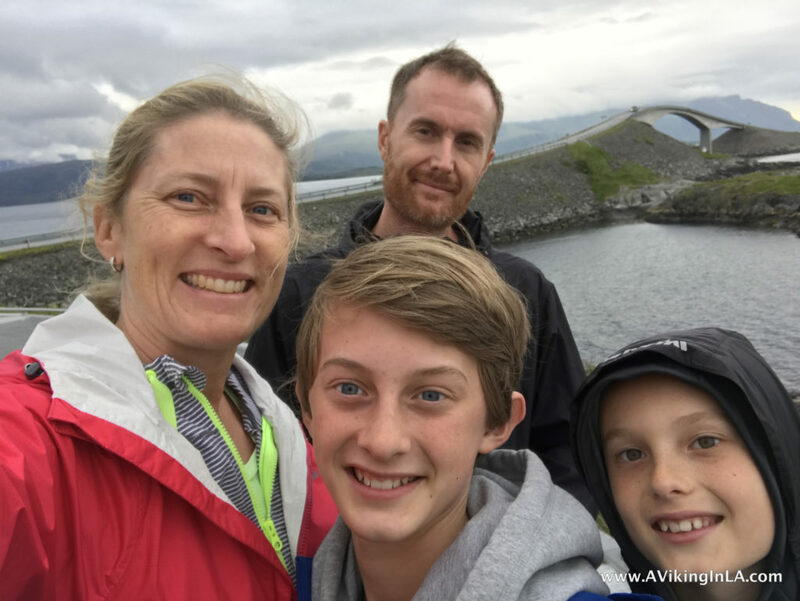 We had just come from the US a few days earlier so we weren’t as homesick for American culture as many of the people there, but we still thoroughly enjoyed ourselves. And it was a lovely summer day which makes all the difference, too. 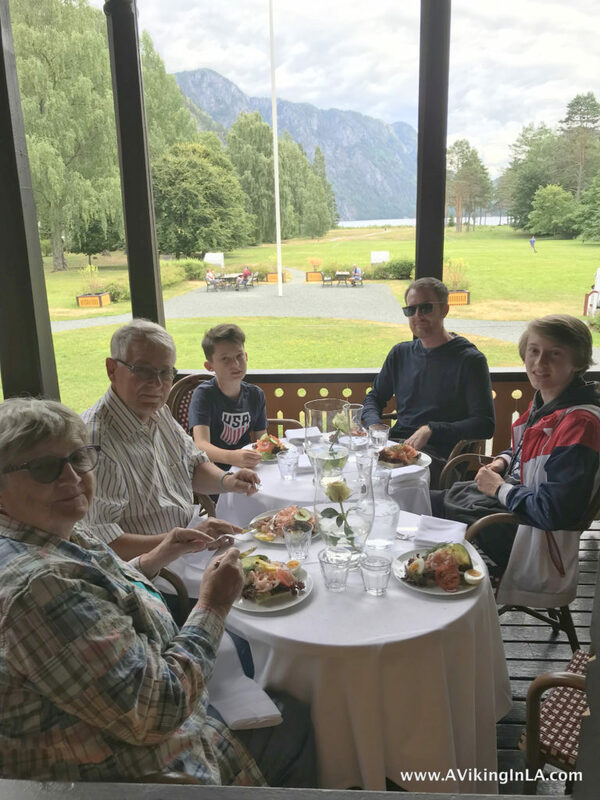 Our summer visit to Norway this year was exceptional. It was hotter, drier, and sunnier than anything we’ve ever experienced before. The kids (and I!) went swimming in the ocean more this summer than all previous summers combined. The air temperature was consistently in the mid to high 80’s, and the water temperature was 80º F at the end of our visit. Truly unbelievable. The star marks the spot of my family’s summer home on an island in the Kragerø area of Norway.